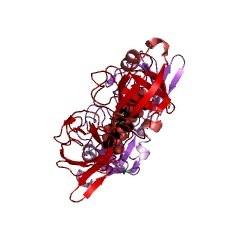 Rare lipoprotein A (RlpA) contains a conserved region that has the double-psi beta-barrel (DPBB) fold. The function of RlpA is not well understood, but it has been shown to act as a prc mutant suppressor in Escherichia coli. The DPBB fold is often an enzymatic domain. The members of this family are quite diverse, and if catalytic this family may contain several different functions. Another example of this domain is found in the N terminus of pollen allergen. 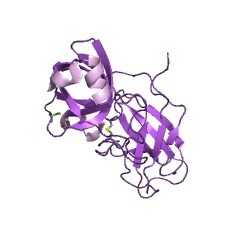 This entry represents a N-terminal domain that has a Barwin-like double psi beta-barrel structure(DPBB). It is found in proteins like expasin and pollen allergens. The major timothy grass pollen allergen Phl p 1 is one of the most potent and frequently recognised environmental allergens [(PUBMED:16750995)]. There are 6395 DPBB_1 domains in 6339 proteins in SMART's nrdb database. Taxonomic distribution of proteins containing DPBB_1 domain. This tree includes only several representative species. The complete taxonomic breakdown of all proteins with DPBB_1 domain is also avaliable. Click on the protein counts, or double click on taxonomic names to display all proteins containing DPBB_1 domain in the selected taxonomic class. A six-stranded double-psi beta barrel is shared by several proteinsuperfamilies. 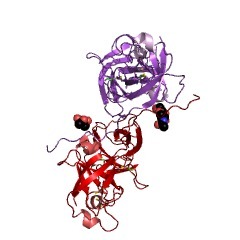 BACKGROUND: Six-stranded beta barrels with a pseudo-twofold axis are foundin several proteins. One group comprises a Greek-key structure with allstrands antiparallel; an example is the N-terminal domain of ferredoxinreductase. Others involve parallel strands forming two psi structures (thedouble-psi beta barrel). A recently discovered example of the latter classis aspartate-alpha-decarboxylase (ADC) from Escherichia coli, apyruvoyl-dependent tetrameric enzyme involved in the synthesis ofpantothenate. RESULTS: Visual inspection and automated database searchesidentified the six-stranded double-psi beta barrel in ADC, Rhodobactersphaeroides dimethylsulfoxide (DMSO) reductase, E. coli formatedehydrogenase H (FDHH), the plant defense protein barwin, Humicolainsolens endoglucanase V (EGV) and, with a circular permutation, in theaspartic proteinases. Structure-based sequence alignments revealed severalinteractions including hydrophobic contacts or sidechain-mainchainhydrogen bonds that position the middle beta strand under a psi loop,which may significantly contribute to stabilizing the fold. Theidentification of key interactions allowed the filtering of weak sequencesimilarities to some of these proteins, which had been detected bysequence database searches. This led to the prediction of the double-psibeta-barrel domain in several families of proteins in eukaryotes andarchaea. CONCLUSIONS: The structure comparison and clustering study ofdouble-psi beta barrels suggests that there could be a common homodimericancestor to ADC, FDHH and DMSO reductase, and also to barwin and EGV.There are other protein families with unknown structure that are likely toadopt the same fold. In the known structures, the protein active sitescluster around the psi loop, indicating that its rigidity, protrusion andfree mainchain functional groups may be well suited to providing aframework for catalysis. 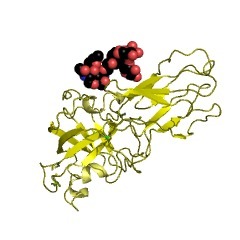 N-ethylmaleimide-sensitive fusion protein (NSF) and CDC48 confirmed asmembers of the double-psi beta-barrel aspartate decarboxylase/formatedehydrogenase family. Multicopy suppressors of prc mutant Escherichia coli include two HtrA(DegP) protease homologs (HhoAB), DksA, and a truncated R1pA. We have isolated three multicopy suppressors of the conditional lethalphenotype of a prc (tsp) null strain of Escherichia coli. One of thesesuppressors included two novel putative protease genes in tandem that mapto 3400 kb or 72.5 centisomes on the chromosome. We propose the names hhoAand hhoB, for htrA homolog, to denote that these genes encode proteinsthat are 58 and 35% identical, respectively, to the HtrA (DegP) serineprotease and 36% identical to each other. The HhoA and HhoB proteins arepredicted to be 455 and 355 amino acids, respectively, in length. Themature HhoA protein is periplasmic in location, and amino-terminalsequencing shows that it arises following cleavage of a 27-amino-acidsignal peptide. Searches of the protein and DNA databases reveal a rapidlygrowing family of homologous genes in a variety of other bacteria,including several which are required for virulence in their host. Deletionof the hhoAB genes shows that they are not required for viability at hightemperatures like the homologous htrA but grow more slowly than wild-typestrains. A second multicopy prc suppressor is the dksA (dnaK suppressor)gene, which is also a multicopy suppressor of defects in the heat shockgenes dnaK, dnaJ, and grpE. The dksA gene was independently isolated as amulticopy suppressor of a mukB mutation, which is required for chromosomalpartitioning. A third dosage-dependent prc suppressor includes a truncatedrare lipoprotein A (rlpA) gene. Genes encoding two lipoproteins in the leuS-dacA region of the Escherichiacoli chromosome. The coding of two rare lipoproteins by two genes, rlpA and rlpB, locatedin the leuS-dacA region (15 min) on the Escherichia coli chromosome wasdemonstrated by expression of subcloned genes in a maxicell system. Theformation of these two proteins was inhibited by globomycin, which is aninhibitor of the signal peptidase for the known lipoproteins of E. coli.In each case, this inhibition was accompanied by formation of a newprotein, which showed a slightly lower mobility on sodium dodecylsulfate-polyacrylamide gel electrophoresis and which we suppose to be aprolipoprotein with an N-terminal signal peptide sequence similar to thoseof the bacterial major lipoproteins and lysis proteins of somebacteriocins. The incorporation of 3H-labeled palmitate and glycerol intothe two lipoproteins was also observed. Sequencing of DNA showed that thetwo lipoprotein genes contained sequences that could code for signalpeptide sequences of 17 amino acids (rlpA lipoprotein) and 18 amino acids(rlpB lipoprotein). The deduced sequences of the mature peptides consistedof 345 amino acids (Mr 35,614, rlpA lipoprotein) and 175 amino acids (Mr19,445, rlpB lipoprotein), with an N-terminal cysteine to whichthioglyceride and N-fatty acyl residues may be attached. These twolipoproteins may be important in duplication of the cells.